Usage of excess electrical energy from Renewable Energy sources can be realized e.g. by Power-to-Heat (P2H), Power-to-Gas (PtG) or Power-to-Liquid (PtL). P2H can react very fast, is small and has a favorable price. PtG and PtL ramp-up is long, their unit size is big and construction time is long. So the systems are not competing but complementing each other. In a PtL factory, water and carbon dioxide from air or a producer (e.g. food or cement industry) get processed; the end product is methanol. It can be upgraded to gasoline for powering means for long distance transport like ships or to airplane fuel. 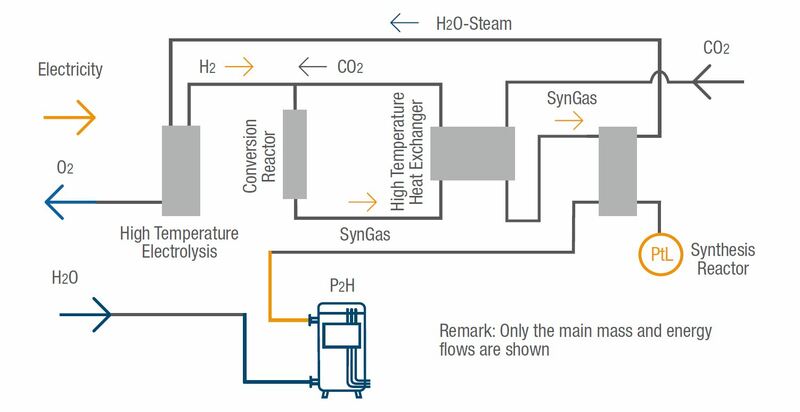 During ramp-up of the PtL process, P2H is needed for preheating the process water. P2H will start converting the excess electrical energy within a second. The PtL electrolytical vessel will take over parts of this electrical excess energy step-by-step in a material-protecting manner as soon as it gets on temperature. 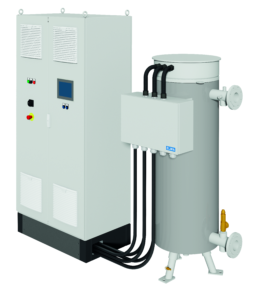 The P2H heater can later also be used for converting voltage peaks or additional short-term excess energy to thermal energy. PtL is a sales opportunity for plant builders in the oil refining industry, producing fuel from almost cost-free excess renewable energy – which otherwise would have been left unused. While private cars will increasingly be powered electrically, long distance transport on ships and airplanes will depend on liquid fuel for decades. The amortization of the PtL/P2H system will usually be after about 15.000 operation hours (2+ years). Planners, developers and system integrators are welcome to contact us for more details.